Perhaps I’ve been spoiled. The past few years of animation has been absolutely stellar, with Pixar churning out masterpieces and DreamWorks valiantly trying to match their rival's output. Add in sporadic appearances from Hayao Miyazaki and Sylvain Chomet and the past few years have given audiences some impressive animated features. 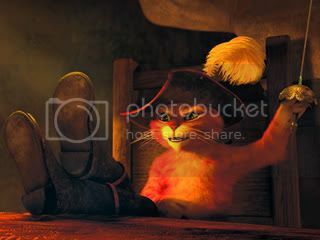 But the amount of animated dreck this year has taken me by surprise, with DreamWorks’ Puss in Boots sitting somewhere in the middle of things. Puss in Boots coughs a hairball of ideas, where it strings together a yarn comprised of fairy-tale gimmickry, spaghetti western pathos, and Spanish storybook folklore. At times, the film can be surprisingly effective, though it never really clicks together in a cohesive manner, therein making it all feel more like a series of vignettes rather than a full-fledged animated feature. 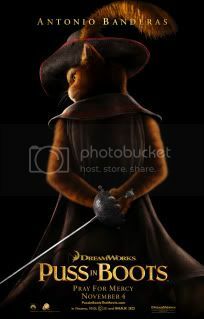 Antonio Banderas voices the title character with a sincerity that carries the film throughout its runtime, particularly in an oddly-paced opening act. As Puss goes on his adventure with friend-turned-enemy Humpty Dumpty (Zach Galifianakis) for magic beans, writers Tom Wheeler, Brian Lynch, and Will Davies roughly sketch a narrative for the duo to operate under. At times, the general aimlessness of the narrative provokes the idea that the whole adventure is improvisational. While Puss in Boots touches upon themes of vengeance and loyalty, those themes seem lost in the chaos of the narrative. It’s a shame, particularly given that there’s a lot of effort to flesh out the secondary cast. Humpty Dumpty is an especially interesting character, wherein his narrative arc touches upon a particular gray area that makes him an interesting adversary to the charismatic title character. Of course, there’s a fair share of egg jokes to cushion the darker material. Puss in Boots’ most impressive quality stems from its rich visual design. While not the most unique visual experience of the year, there are some impressive sights to behold. It’s largely due to the topography of the journey, as the Spanish-Western setting is expansive and beautifully realized. The visual design for the Humpty Dumpty character is quite impressive as well, as the physics of his movements and expressive face show a great level of detail to the craft. While the narrative has its share of problems, I relished in the film’s visual appeal. But it’s unfortunate that having a rich visual design and a strong narrative have become mutually exclusive for most animated films of 2011. Well, at least there's Rango.